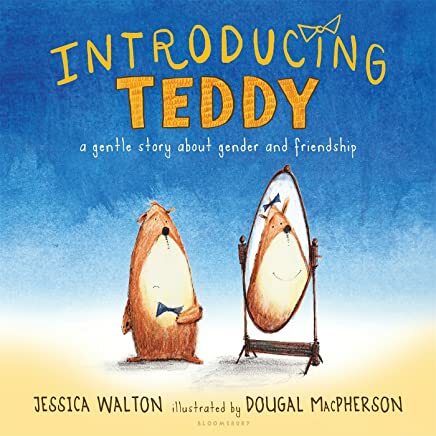 Introducing Teddy: A Gentle Story About Gender and Friendship (2016), written by Jessica Walton and illustrated by Dougal MacPherson, is a whimsical and accessible picture book about gender expression and the power of self-identification. The teddy bear protagonist does everything with a friend named Errol. They climb trees, play in their garden, and have tea parties. At the beginning of the book, Errol calls the teddy bear Thomas, and Thomas is depicted with a blue bow tie. But that changes. The teddy bear wakes up sad one morning and decides to share something with Errol. The teddy bear tells Errol that she has always felt like a girl and would like Errol to start calling her Tilly. Errol immediately accepts Tilly and assures her they will remain friends. The two invite another friend, a human girl named Ava, to the park. When Ava learns about Tilly’s gender identity, she is quick to accept her. A confident Tilly moves her bow tie to her head, feminizing her appearance. Nothing about the children (and teddy bear’s) friendship changes. This book offers adults a beautiful way to introduce young children to gender diversity, agency, and friendship. It’s not just Tilly that troubles gender. Errol’s love of tea parties and super cool girl best friend are an important part of the story, and the work in does! Highly recommended for young readers two to six, although the story could also be shared with older children. It will surely prompt conversation with its affirming message about gender and friendship!